Superintendent Watson hosted his STAT members for their 4th quarter meeting. They continued their ongoing work around school culture and strategized using the LEGO Serious Play tools. Superintendent Steve Watson welcomed teachers to his new STEM Resource Center. In the future, teachers can attend STEM training and “shop” for items to enhance their classrooms experiences. Most items were donated by Amazon. Where’s Watson? At Quentin STEM Academy in the Littleton Elementary School District! Superintendent Watson enjoyed learning about their kinesthetic approach to education. 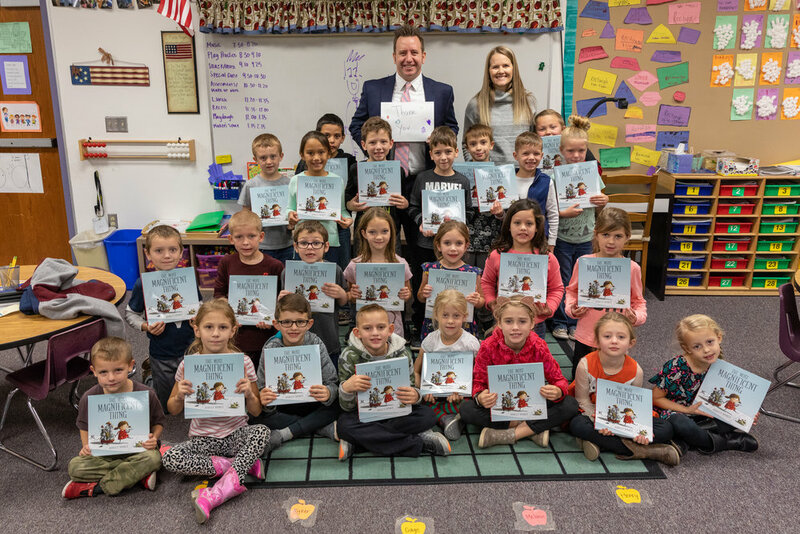 The superintendent delivered Watson’s Book Club winner Shelly Miller and her kindergarten class at Stetson Hills Elementary the book Chrysanthemum by Kevin Henkes. Maricopa Public Health joined in the fun and brought smoothies and Fruitman for the students too! Superintendent Watson welcomed educational leaders from Guatemala to the office to learn more about our REIL-Extend Project and the Learning Observation Instrument. Armenian nationals visited the Superintendent and his office with the International Visitor Leadership Program to learn more about the support offered to teachers through technology. Desert Oasis Elementary School in the Nadaburg School District empowers teachers by creating leadership opportunities within their classroom.They invited Superintendent Watson to observe their unique leadership program during Where’s Watson. 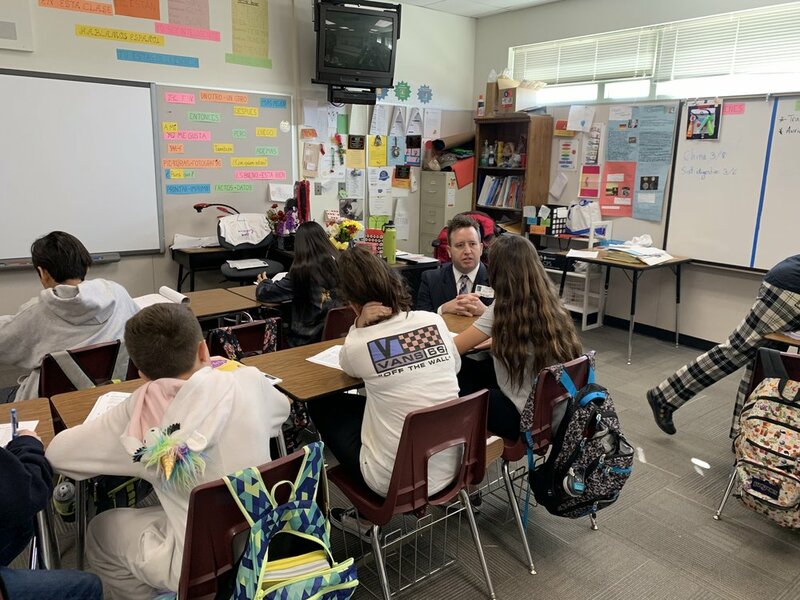 Superintendent Watson visited the elementary schools in Cave Creek School District to learn about their World Language Programs in Spanish, French and Chinese. Ms Ruskin's kindergarten class at Morristown Elementary received the book Something Good by Robert Munsch as winners of Superintendent Watson’s Book Club Giveaway! The superintendent and STAT members discussed teacher retention, school climate and education advocacy during their 3rd quarter meeting. Arizona Superintendent of Public Instruction Kathy Hoffman also attended to take part in the conversation. 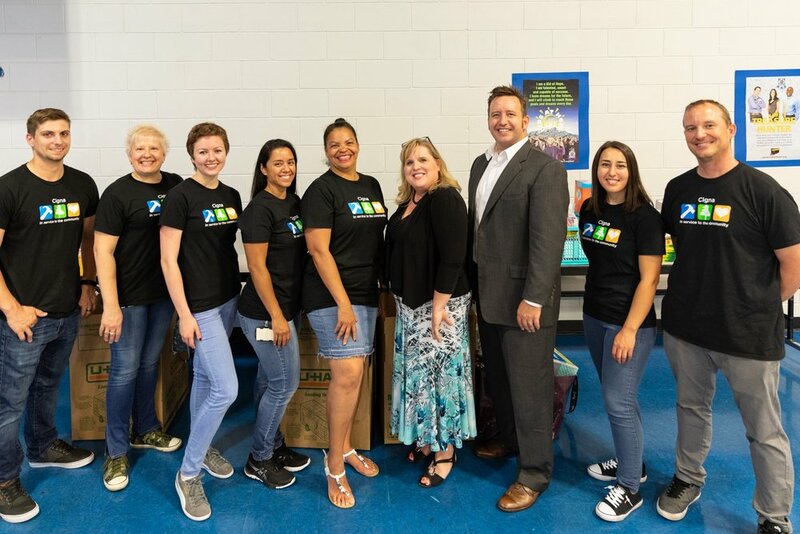 Staff members joined Superintendent Watson on a Goodwill Mission tour. They learned about the opportunities Goodwill provides the community through their career center. Superintendent Steve Watson visited Mrs. Kalfas 1st grade class at Zaharis Elementary to read to them Most Magnificent Thing. Kalfas won Watson’s Book Club contest by sharing her favorite book. The contest also included the copies of the book for each student and MP3 players filled with literature for Kalfas’ reading center. Canyon Ridge K-8 School (Dysart District) showed Superintendent Watson the things they were working in their Dependable Education Products Company (DEPCO) Lab when he visited to learn more about their STEAM-focused school. The Superintendent Teacher Advisory Team (STAT) met to discuss the importance of sharing their stories and to discuss the tools that are available to advocated for education. Superintendent Watson visited Zaharis Elementary in Mesa Public School District to learn about the inquiry-based education curriculum they follow. The school will be featured as part of an upcoming Where’s Watson. Miss Maya’s class, from the Cartwright School District, invited the superintendent to participate in their Classroom Champions’ lesson on diversity. This program partners students with Olympians to mentor them throughout the school year. Mountain View School, in the Dysart Unified School District, invited Superintendent Watson to their STEAM Day. Each grade level was assigned different challenges centered around the theme of natural disasters. The students of Edison School of Innovation, in Glendale, loved showing Superintendent Watson their coding project during the filming of Where’s Watson. The Superintendent Teacher Advisory Team (STAT) met to assist Superintendent Watson in creating a teacher advocacy toolkit using the Human Centered Design process. Superintendent Watson learns about the Algebra in Manufacturing Processes Entrepreneurship and Design (AMPED) Program at Alhambra High School. Superintendent Watson discussed monitoring water usage in Arizona with Natalie Mast and Brian Conway at the Arizona Department of Water Resources for an upcoming STEM Pro Live. Superintendent Watson and Principal Dina Cutler receive a school supply donation from Cigna for Esperanza Prep. Superintendent Watson facilitates one of three teacher feedback sessions. The Superintendent hosts teachers and Senator Kate Brophy McGee for a 2019 State Budget Q&A. Superintendent Watson reads a book to participants of the Maricopa County Reads Summer Reading Program. 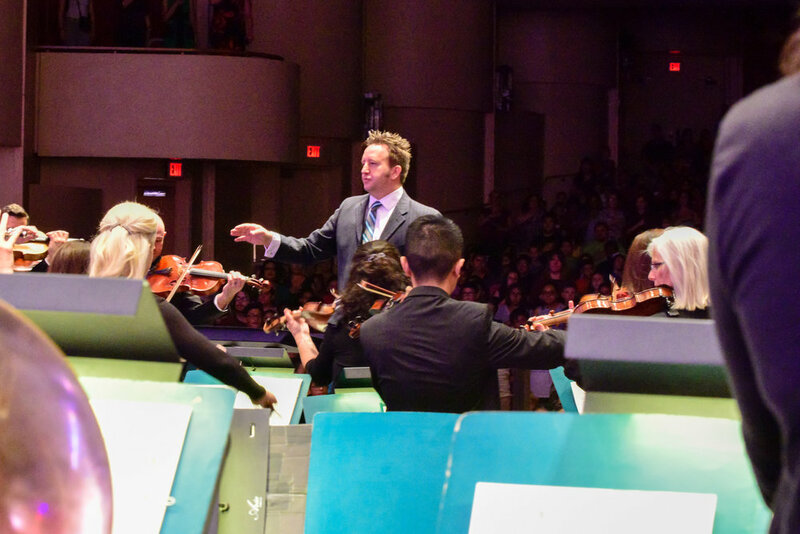 Superintendent Watson guest conducts the Phoenix Symphony during a symphony school performance. The superintendent presents certificates to school leaders that completed the Aspiring Principal Program. Superintendent Watson passes out ice cream to Supervisor Gallardo from his Paletero which he rode during Bike to Work Day. Superintendent Watson presents the 2018 Maricopa County Exemplary Principal Award to Hartford Sylvia Encinas Elementary School Principal, Mrs. Heather Anguiano. Also pictured, Unified School District Superintendent Dr. Camille Casteel. Superintendent Watson presents the 2018 Maricopa County Exemplary Principal Award to Kyrene Traditional Academy Principal, Dr. Marianne Lescher. Also pictured, Kyrene Elementary School District Superintendent Dr. Jan Vesely. Superintendent Watson presents the 2018 Maricopa County Exemplary Principal Award to Gateway Pointe Elementary School Principal, Tim Fountain. Also pictured, Higley Unified School District Superintendent Dr. Mike Thomason. 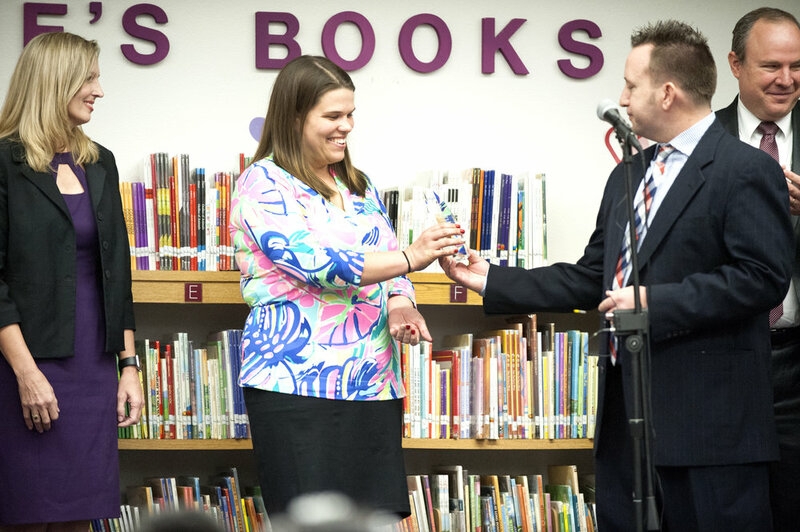 Superintendent Watson presents the 2018 Maricopa County Exemplary Principal Award to Trailside Point Performing Arts Academy Principal, Sarah Zembruski. Also pictured, Laveen Elementary District Superintendent, Bill Johnson. Superintendent Watson presents the 2018 Maricopa County Exemplary Principal Award to Madison Heights Elementary Principal, Priscilla Gossett. 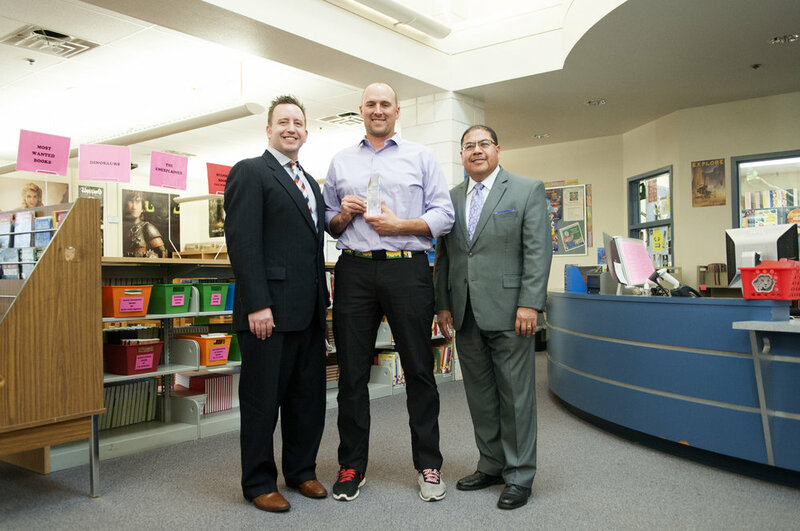 Also pictured, Madison Elementary District Superintendent, Dr. Quinn Kellis. 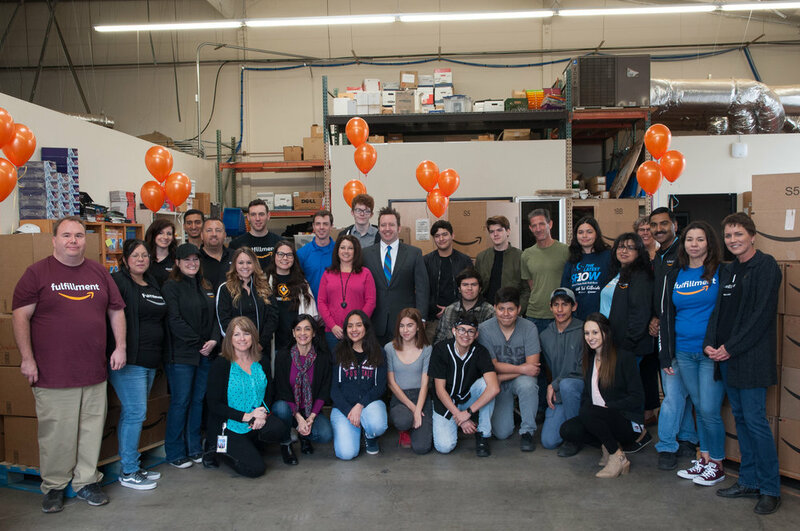 Superintendent Watson poses with volunteers from Amazon, MCESA, and students from BioScience High School prior to accepting a large donation of electronics for schools from Amazon. Superintendent Watson presenting on a panel at the Arizona Association for Gifted and Talented Conference. 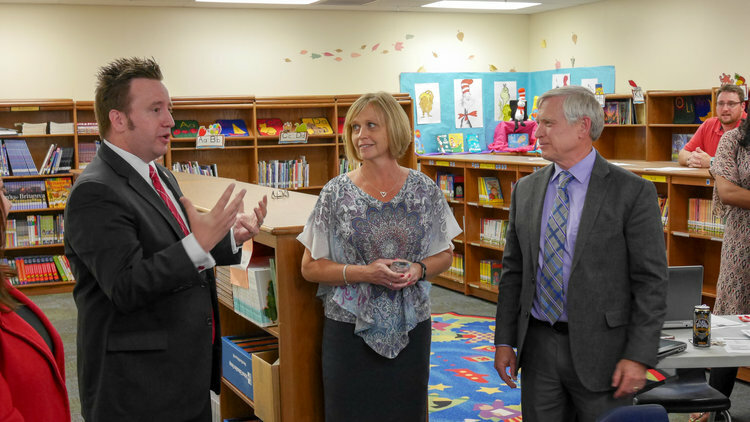 Superintendent Watson visited Gililland School in the Tempe Elementary School District. He observed a business education partnership that is pairing landscape architects with geometry students to design front yards for local residents. Superintendent Watson participates on a panel during the Arizona Business & Education Coalition (ABEC) Conference. Superintendent Watson delivers 30 Galaxy Tablets to Leslie Specktor at Madison Heights Elementary. Leslie won the Superintendent's October technology give away. Superintendent Watson talks with Palo Verde Nuclear Power Plant official during the power plant's World Teachers' Day event. Superintendent Watson paints poles at Mountain View Elementary during Love Our Schools Day. Superintendent Watson visits with Morristown Elementary teachers to hear about the challenges and benefits of teaching in rural Maricopa County. Superintendent Watson presents new smart televisions to the superintendent and staff of Aguila Elementary. 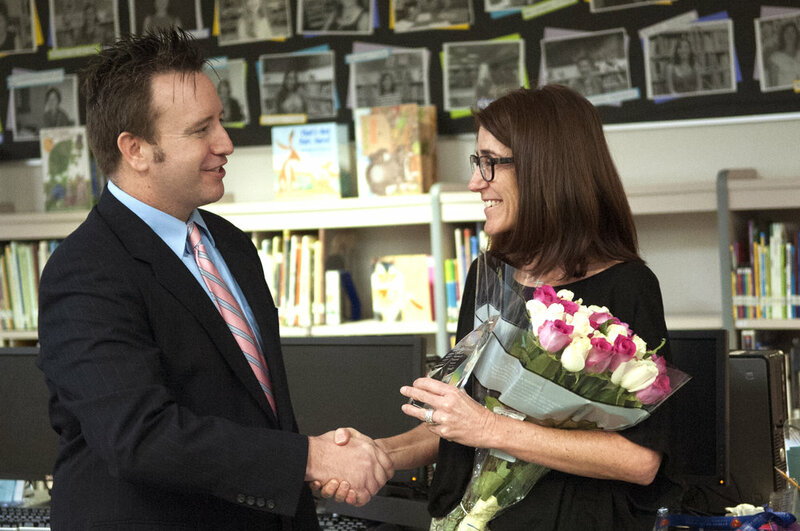 Superintendent Watson presents 30 Galaxy Tablets to teacher Angela Copper. Angela won the tablets in the Superintendent's monthly tech giveaway. Superintendent Watson provides opening remarks at the Arizona Sci Tech Festival at the Mesa Center for Performing Arts. Superintendent Watson inventories donated backpacks prior to delivering them to Maricopa County schools. Superintendent Watson with (from left) Tracy Benson, ASBA; Jennifer Johnson, Grand Canyon University; and Lori Shough (MCESA) at the Great Teachers, Great Classrooms, Strong Communities event put on by Expect More Arizona. Watson delivers opening remarks during the MCESA Math Leaders in Action event. Superintendent Watson grabs a selfie at the Skills USA Championships. Superintendent Watson swears in appointed Avondale Elementary Governing Board member, Megan Griego. The Superintendent read a book in Spanish with Dual Language kindergarten students at Encanto Elementary School. 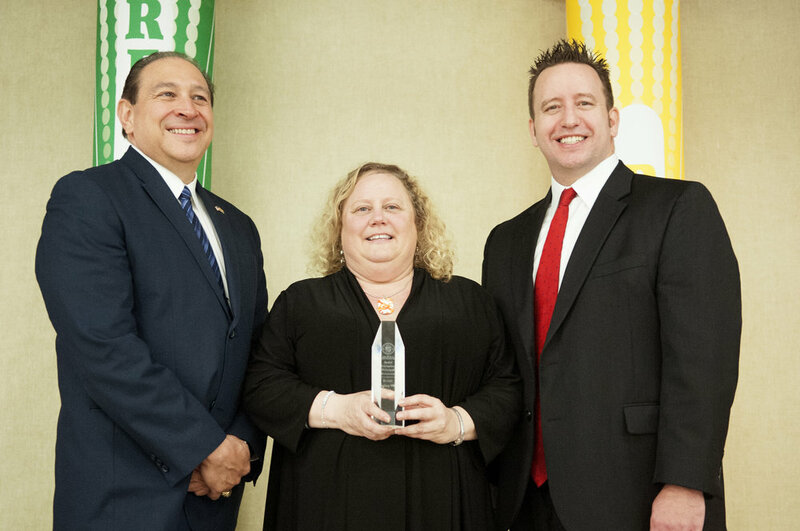 Sunset Elementary School Principal, Kristi Langley-Wells (center) receives Exemplary Principal award from Superintendent Watson and Cartwright Elementary District Superintendent, Jacob Chavez (left). 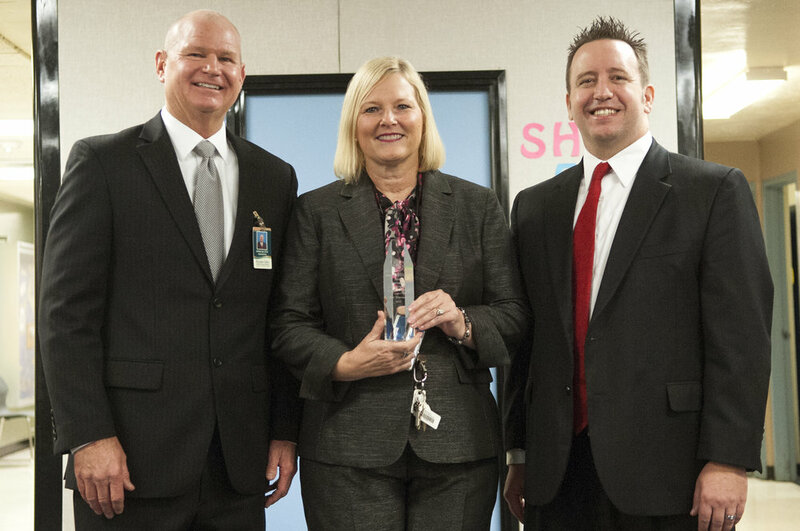 Superintendent Watson presents Jan Stevens (center) with Exemplary Principal award with Paradise Valley Unified District Superintendent, James Lee. 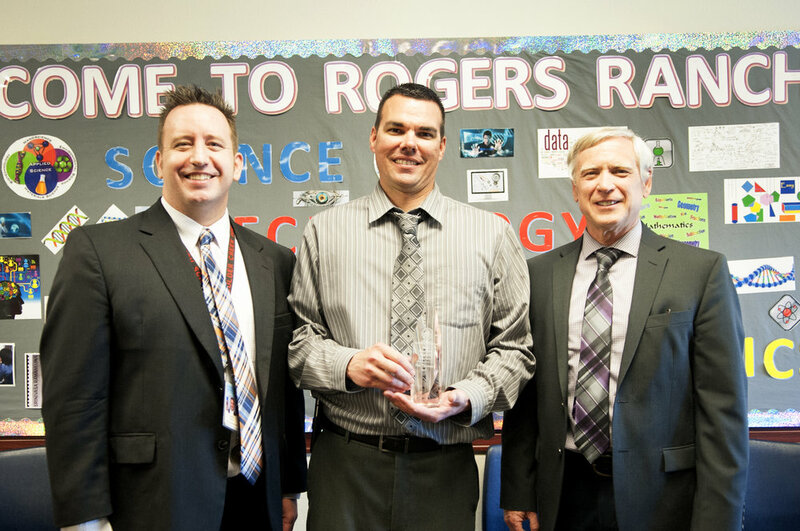 William C. Jack Principal, Denis Parcells (center) receives Exemplary Principal Award from Superintendent Watson, and Glendale Elementary Superintendent, Joe Quintana (right). Superintendent Watson presents Hilary Obrian with the Exemplary Principal Award for her leadership at Madison Camelview Elementary. 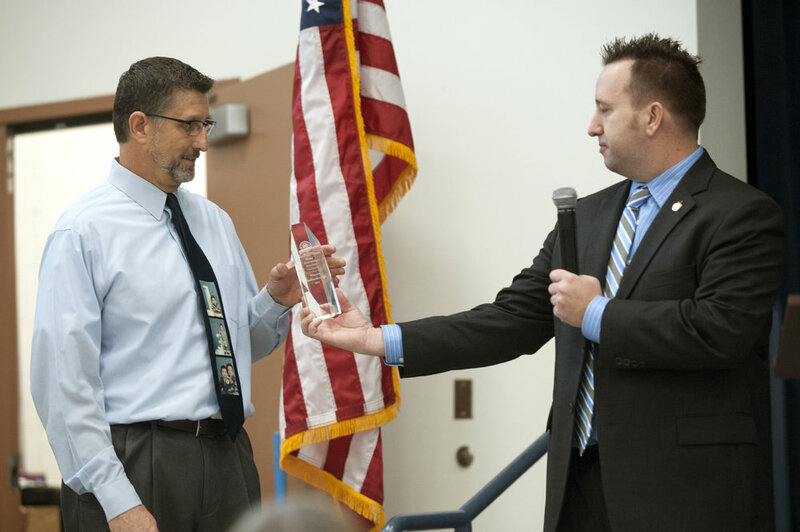 Superintendent Watson presents Desert Thunder Elementary Principal, Wayne Deffenbaugh with 2017 Exemplary Principal Award. Superintendent Watson visited Hope College and Career Readiness Academy. The school provides real-world internships for students. 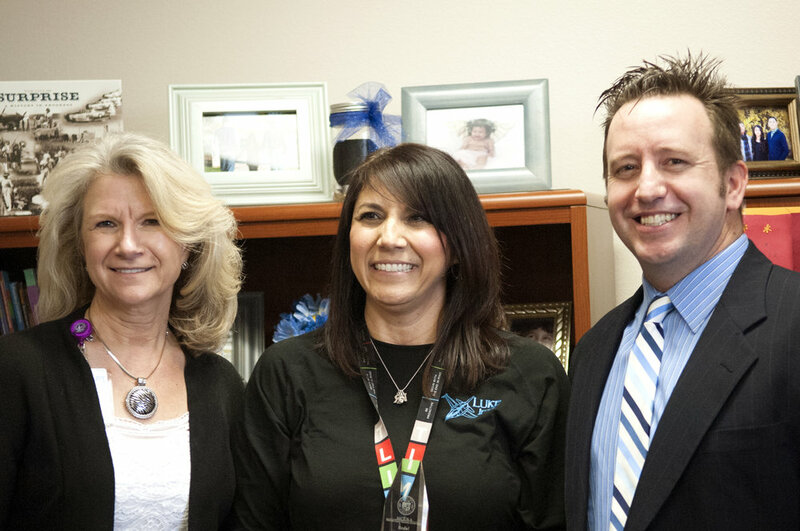 Superintendent Watson recognizes Amelia Garcia (center) as Exemplary Principal with Dysart Superintendent, Gale Pletnik(left). Superintendent Watson presents Tonja Yaung, principal of Kyrene de los Ninos, with the Exemplary Principal award. 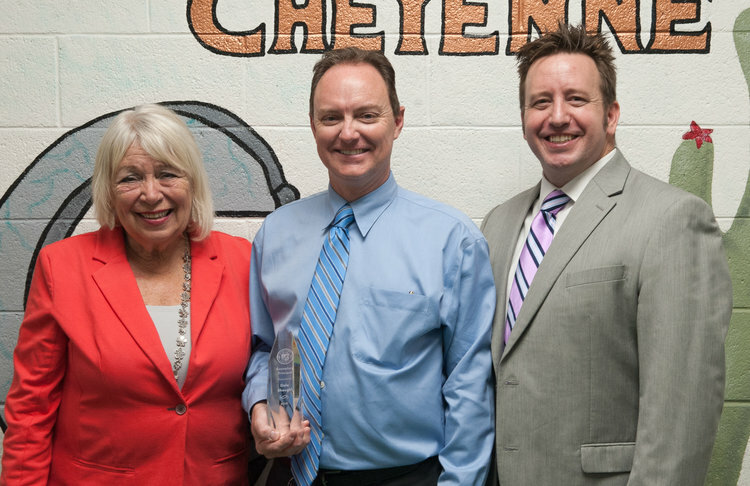 Exemplary Principal recipient Tim Thomas (center) with Superintendent Watson and Laveen Elementary District Superintendent, Bill Johnson (right). Superintendent Watson welcomes the Technical Assistance Team from Wesat to MCESA. Superintendent Watson learns about robotics from middle school students at Arizona School for the Arts. Superintendent Watson attends the School Connect Summit at Grand Canyon University. Superintendent Watson introduces his family at Swearing In Ceremony. 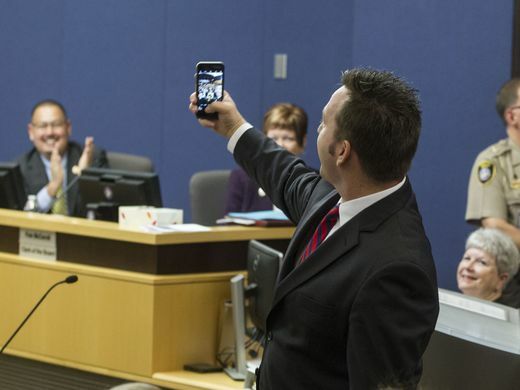 Superintendent Watson delights crowd as he takes a selfie after being sworn in as Maricopa County School Superintendent.